One bedroom with city view featuring 2 single beds or one double bed and a sofa bed, living room with sofas, private bathroom with shower and kitchenette with a dining table. Can be added: 1 extra bed and 1 baby cot. One bedroom with a city view with windows down to the floor, featuring one double bed or 2 single beds and a sofa bed, living room with sofas, private bathroom with a shower, kitchenette with a dining table. Suites with city views are located on the 22nd floor and above. Can be added: 1 extra bed and 1 baby cots. There is a short distance from both the major airports that are in the city to Byotell Flora Residence. Byotell Flora Residence complex offers you the luxury accommodation with view of the famous Prince islands and the Marmara Sea. Byotell Flora Residence complex is also very close to the world- known Baghdat Street which has lots of famous open air shops and dining area which you can enjoy your whole day. The Hotel is close to shopping malls ,recreation areas and a modern residential area with bustling, high-rise businesses. Prices are based on room only. Breakfast, lunch and dinner is served at an extra charge. Centrally located in Atasehir, close to the Baghdat Street. 20-25 min drive to Bagdad Avenue, Maiden’s Tower, Palladium, Brandium, Carrefour. 30 min transfer from Sabiha Gökçen airport. Köfteci Ramiz: serve grills, salads and desserts within the day. Mado: serve cakes, desserts, regional tastes, ice cream and drinks. Biking on Istanbul streets is one of the most exciting ways to explore Istanbul and it would be nothing like an ordinary bike ride. Hire a guide to make the most out of this experience. Heybeliada, being a car-free island is a great place to ride a bike. You may start off “Around the Golden Horn” track, on the north end and not very distant from the Galata tower. Cycle your way across the bridge and explore the off-road terrain of Istanbul. Stop to take plenty of photos or satisfy your curiosity by asking questions from your guide. It is absolutely an amazing thing to experience no matter how early you may have to get up for this. 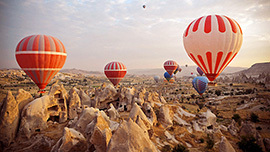 The panorama of the entire Goreme is dreamlike from above while you are riding a hot air balloon. Just as the balloon takes off, it’s bewildering to see the spectacular landscape, along with many other balloons surrounding yours. It would softly drift over pigeonholes, fairy chimneys and the inimitable rock formations. The entire experience would turn out to be implausible and mind-blowing!! Do not to forget to make a video if you may, to share with your friends and family back home. Start your day with a Turkish breakfast, which has earned its fame for the variety it presents. 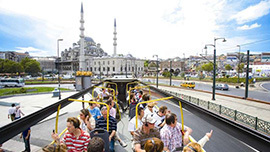 You may spend a day to explore the islands of Istanbul for a rendezvous in an exciting new environment. Adore the sea and the sun or fancy to ride a bike to reinvent the city with your eyes. Otherwise, you may choose to dedicate your day to tour around the city and make your stay worth the while. Initiating your discovery tour at the ancient peninsula, you can swing several shrines belonging to the civilizations that had established here. 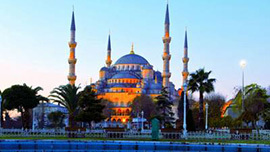 Nuru Osmaniye, the Grand Bazaar, Çemberlitas, the Blue Mosque, Basilica Cistern, Archaeological Museum and Hagia Sophia are reckoned among the main sites you may specifically appreciate touring. Later, you can traverse the Golden Horn Bridge and relish a coffee break at Karaköy before you move to Tünel and head up the Galata Tower to observe the impressive vista of Istanbul. Ultimately, you can praise the scrumptious Turkish cuisine at any of the diners at Beyoğlu and finally pause at the coast of Arnavutkoy to revel in the grandeur and charm of Istanbul as the night falls. Pierre Loti, on the other side, is one of the most soothing and serene spots in Istanbul. It tempts the vacationers to sip some Turkish Tea and appreciate the view there. Eminonu is a fitting place to acquire gifts and souvenirs to let you relive the unforgettable time you had experiencing Istanbul. The districts nearby, with huge shopping centers offer greater and finer shopping trips you may desire to experience. This deep-seated city, with an account trailing back to 300 thousand years before, composes a collage of numerous societies and philosophies mingled. It has been the center of three tremendous empires, the Byzantine, Roman, and Ottoman empires, and for over 1600 years, 120 sultans and emperors governed the world from here. There is no city in the world other than this one that could declare such a prominence. Let us draw inspiration from the historic magnificence of Istanbul. 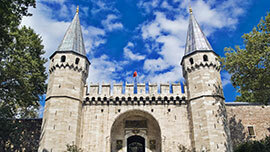 Topkapı is the course of more vibrant stories than most of the world's heritages combined. Passionate sultans, aspiring courtiers, stunning concubines and calculating eunuchs dwelled and worked here from 15th to 19th century, while it used to be the court of the Ottoman empire. Seeing the palace's rich pavilions, reclining Harem and jewel-filled Treasury, overlays an appealing peep into their lives. This is a stunning structure and regardless of aggregation of people from all across the world, it has a thought-provoking peace about it. Take time to delve in the ambiance of angular curves created with the tiles, lanterns hanging low and the sophisticated enhancing work underneath the domes. Every inch of this place declares capacities of the artistry of the workers who created it. Hagia Sophia is an amazing architectural wonder and a significant testament both for Ottoman and Byzantine Empires. Earlier a church, then a mosque, and a museum today, Hagia Sophia has always been the valuable in every time. On the western verge of the Hippodrome, this Ottoman palace was fostered in 1524 for Ibrahim Pasa. During the time of research, it underwent an extensive revamp. This museum holds a superlative compilation of artifacts that include wonderful instances of calligraphy and one of the world's most remarkable selections of antique carpets. The historic marvels in Istanbul never seize to amaze the vacationer’s eye. Layers of history would unfold in your imagination once you step foot in the magical city.